THE	"Saracen’s Head" is well situated in the centre of Southwell, and probably it fulfilled its useful purpose as an inn down to 5 May, 1647. On that day an event occured within its walls which has made it famous. In those days it was called "The King’s Head," and it was here at seven o’clock in the morning that King Charles arrived heartbroken and weary after an all-night ride undertaken in appalling circumstances, and accompanied by his faithful friend, Dr. Hudson. From Charles’ point of view the war was over and lost, and he was trying to make the best terms he could. Negotiations had been going on between Charles and the Scottish Commissioners, and at last Hudson had succeeded in obtaining terms which would be acceptable to both sides. Charles had stolen out of Oxford, and, after a circuitous journey, he reached Southwell, where he met Montreuil, the French envoy, who was acting as intermediary. 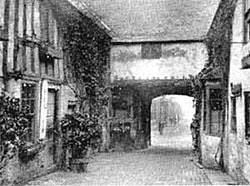 Montreuil was at the "King’s Head," occupying the two rooms on the left of the entrance now thrown into one to form the dining-room, and he gave up his room to the weary traveller. Charles also seems to have occupied rooms on the first floor. Here Charles invited the Scottish Commissioners, who were lodged at the Episcopal Mansion (now in ruins), and after talking things over with them, he surrendered, and was invited to accompany them to the headquarters of the Scottish Army at Kelham "for security." That was the end of King Charles as a free man ! During the Commonwealth the name of the "King’s Head" was anathema, and it was changed. It is to be wondered if the "Saracen’s Head" is a covert reference to Charles II., who was referred to by his friends as "The Black Boy," after his flight from Worcester and during those days when loyalty spelt danger.